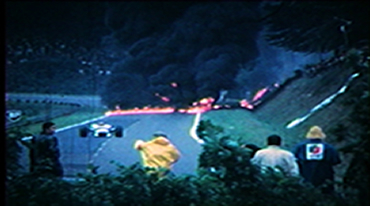 Bigger Picture Films - Grand Prix Killer Years, Deadliest Crash, outstanding factual and commercial film production. The seminal film 'Grand Prix the Killer Years', a shocking insight into when Grand Prix was out of control, has been released as a book. John Matthews, the co-director and producer of the original film and editor of the book says 'when we made 'Killer Years', most of the amazing interviews had to be left out, which I found very frustrating. When you make a film you only end up using about 3% of the material, the rest ends up on the cutting room floor. It's hard to decide what to keep. So here we share with you pretty much all of the interviews as they were said. There is hardly if any editing at all. What we have here is a record, an important part of sport history, recorded forever. 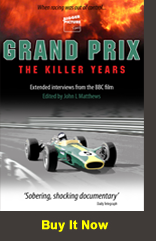 The book 'Grand Prix the Killer Years' is a collection of the original interview transcripts, taken directly from the Bigger Picture film tapes. From World Champion Emerson Fittipaldi crying in the car park, to Sir Jackie Stewart and Jackie Oliver narrowly avoiding death, the interviews offer a candid insight into the time when a driver being killed in a Grand Prix had become normal. Featuring many famous drivers including three World Champions, Emerson Fittipaldi, Sir Jackie Stewart OBE, John Surtees OBE, this fascinating book is a perfect addition to any collection and a must read for anyone who has seen the film or loves Grand Prix. 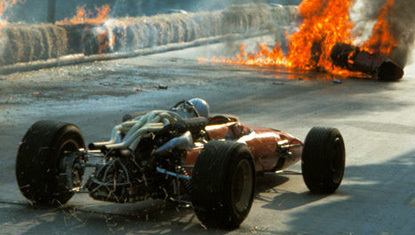 In the 60s and early 70s it was common for Grand Prix drivers to be killed racing, often televised for millions to see. Mechanical failure, lethal track design, fire and incompetence snuffed out dozens of young drivers. They had become almost expendable as eager young wannabes queued up at the top teams gates waiting to take their place. This is the story of when Grand Prix was out of control. Featuring many famous drivers including three times world champion Sir Jackie Stewart OBE, twice world champion Emerson Fittipaldi and John Surtees OBE, this exciting but shocking film explores how Grand Prix drivers grew sick of their closest friends being killed, to finally take control of their destiny. After much waste of life, the prestigious Belgian and German Grand Prix's would be boycotted, drivers insisting that safety be put first. But it would be a long and painful time before anything would change. And a lot of talented young men would be cut down in their prime. SAVE £20! 1 COPY MADNESS ON WHEELS HARDBACK, 1 COPY OF KILLER YEARS HARDBACK, 1 COPY OF MADNESS ON WHEEL DVD BOXED - STRICTLY LIMTED OFFFER! BUY GRAND PRIX THE KILLER YEARS HARDBACK! Beautiful Hardback Book for £19.99! Buy Grand Prix The Killer Years Hardback and DVD Bundle For £25.99 + p&p! These DVDs are region zero PAL. It will play on most players. It may not play on a few players. Please check your player it is not our responsibility.